VentZone® IAQ with Heat Recovery Kits combine an Aldes Heat Recovery Ventilator (ERV) with Zone Register Terminals (ZRT) for continuous IAQ exhaust and on-demand boost exhaust. Each ZRT is installed in one bathroom in the house. These kits transfer sensible and latent energy from stale exhaust air to fresh supply air. Perfectly suited for residential applications, VentZone® Systems combine model ZRT demand-controlled zone register terminals and Heat Recovery Ventilators (HRV) to create the quietest, most energy efficient ventilation systems on the market today. Zone Register Terminals (ZRT) replace individual fans or static grilles like those found on other remote fan kits. They control the fan so that areas are only ventilated as desired. Also known as demand-controlled ventilation, controlling the airflow on a zone-by-zone basis saves energy and reduces the load on heating and cooling systems. Each ZRT is fitted with a self-balancing constant airflow regulator that allows controlled amounts of continuous IAQ ventilation when the damper is closed. The primary flow damper opens when called upon by any switch, timer, dehumidistat, or occupancy sensor. Once the damper is opened, the ZRT signals the HRV to boost speed and airflow from the open ZRT, making it ideal for residential bathroom ventilation. In the heating season, the heat recovery ventilator (HRV) draws in fresh air from outside while stale, humid air is exhausted. As the fresh and stale airstreams pass though the unit’s core, the fresh air is tempered with heat recovered from the exhaust air. In the cooling season, fresh outdoor air is cooled by the air-conditioned exhaust air. The system has near-universal compatibility with advance dry contact control, allowing direct interlock with the HVAC systems and most air exchanger models. The onboard low-voltage supply powers up to 5 ZRTs. The entire system is designed for ease of installation by a single trade in most cases. 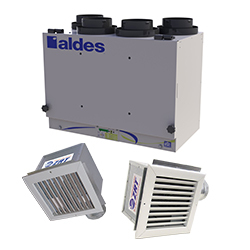 The heat recovery ventilator is compatible with Aldes controllers and most other controllers on the market.